The best way to challenge the 31 km (19 mi) Jaufen pass is to ride it from the east to the west. Located between the Penser Joch in the south and the Timmelsjoch in the north, it offers you the perfect increase in curves and gradient in your ride from one mountain pass to the next. The comparatively moderate climb up from Sterzing finds its peak at 2,094 m (6870 ft) before it follows the twisty and steeper road down into the valley of Passeier. 14 miles long, one of the most beautiful alpine roads in the Austrian Alps, 32 switchbacks on the western ramp, a turquoise artificial lake on top, a place to sit in the sun, drink coffee and enjoy the views, what else could you ask for? It's a toll road, but this awesome ride is well worth the money. King Ludwig II of Bavaria (1845-1886) is one of the tragic figures in Bavarian history. After his father died in 1864, Ludwig became king at a very young age. His interest in art and the love of his country inspired the idea of a new and spectacular castle replacing the ruins in front of the mountain called Schwanstein. In 1868 the plans were completed, in 1869 construction began, and the castle was finished in 1886. Its architecture perfectly matched the surreal dream world that King Ludwig had escaped to. He only lived here for 120 days before he was moved to Lake Starnberg after his deposition by the Bavarian parliament. There he died under mysterious circumstances. Being on tour is great. Packing your bag every day is sometimes not that great, finding the next hotel can be a challenge and then you will ride almost every day, no matter the conditions. Our Touring Centers offer you five beautiful day trips from one home base, a comfortable hotel (in category 1, 2 or 3), located in the middle of one of Europe’s best motorcycling areas, in this case the Austrian Alps. Every day you have the choice: follow one of our planed loops (no guide), go on your own ride or do something entirely different. Play a round of golf, go to the pool or treat yourself to the spa, do some shopping, sightseeing or hiking. Bring your family, even if they don’t ride. While you’re out enjoying the Alpine twisties, they can take advantage of the hotel and the surrounding attractions. The loops include some of the top riding highlights in the Alps, but we’ve got some hidden jewels in stock for you as well. 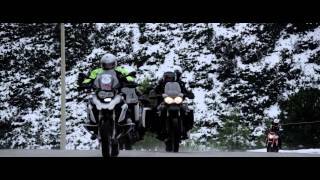 Enjoy a great motorcycle tour in the Alps – without drawbacks. My wife and I did a five day self guided tour with Edelweiss in September, 2018 in the Austrian Alps and it was a wonderful experience. The BMW we rented was top notch and the gps routes they provided us with (along with the commentary therewith) made for wonderful rides. It was obvious that someone that rides motorcycles put the routes together. Also, the hotel was absolutely first class (Hotel Klosterbrau in Seefeld, Tyrol). Pickup and drop off of the bike was easy and painless. All in all, it was a first class experience all around. 5/5 stars for sure.